Whether it is residential or commercial we have a complete line of products and services for you and your clients. We are Tucson’s home team with local management and underwriting to provide a full line of services and quick answers to serve your needs. 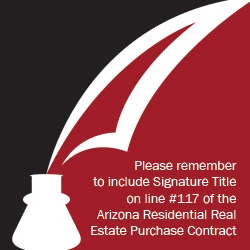 Our Title Professionals possess the strongest skills in the Tucson community. Junior and Limited Loan Policies. These products provide the buyer’s and lender’s of real estate with varying levels of protection against loss of their investment, which may arise from unexpected defects in title or the legal expenses which may be incurred thereafter. Signature Title is underwritten by Old Republic Title, Title Resources, and First American Title.